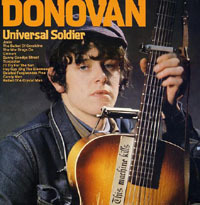 All songs by Donovan P. Leitch, except 01 by Buffy Sainte-Marie, 04 by Mick Softley and 11 traditional arranged by Donovan P. Leitch. Sunny Goodge Street arranged by Terry Kennedy. · On the back cover there are notes by an unknown author. · To Try For The Sun is listed as I'll Try For The Sun. · Ballad Of A Crystal Man is listed as The Ballad Of A Crystal Man on the front cover.